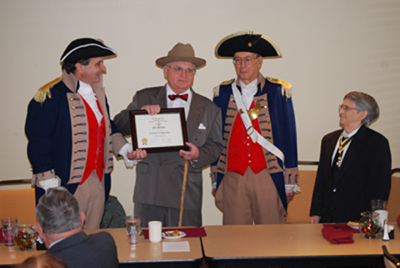 Harry S. Truman Chapter President William Hartman, the Harry S. Truman Chapter Color Guard, and Mr. Neil Johnson of Independence, Missouri, are shown here at the December 13th, 2008 Christmas Luncheon. Mr. Johnson, a Harry S. Truman impersonator, provided a very interesting presentation and overview on the life and times of Harry S. Truman. Mr. Johnson portrayed the 33rd President of the United States, telling about anecdotes on Harry's life, and wise sayings that Harry made. Left Photo: Mr. Neil Johnson of Independence, Missouri. 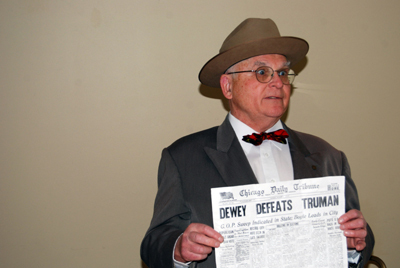 His portrayal of Harry S. Truman holding the November 2, 1948 edition of the Chicago Daily Tribune "John Dewey defeats Harry Truman for the United States Presidency". The Chicago Daily Tribune, eager to get an edition out before polls officially closed, guessed incorrectly in a famous journalistic blunder. Right Photo: (L - R) Vice-President Dirk A. Stapleton, Harry S. Truman Chapter; Mr. Neil Johnson of Independence, Missouri; Major General Robert L. Grover, MOSSAR Color Guard Commander; and President William Hartman, Harry S. Truman Chapter.